This interactive presentation contains the latest oil & gas production data from 78,491 horizontal wells in 10 US states, through July. Cumulative oil and gas production from these wells reached 7.4 Gbo and 76.9 Tcf. Now that the production data I have for Texas is more complete (by including the ‘pending production’ reports), we can get a more complete picture of how oil production from horizontal wells has developed in 2017 in most of the US shale basins. Since the low in September last year, output has risen again, and is nearing the previous high in March 2015. Oil production from wells that started in 2017 (the pink area in the above graph) contributed already more than 30% of total production in July (1.3 vs 4.0 million bo/d). If you switch to gas, you can see that gas production has continuously grown since 2010, and that in 2017 the growth rate is faster than in the previous 2 years. This excludes production from Ohio and West Virginia, which both do not regularly post new data and are therefore deselected. Remarkably, the gas output from wells that started before 2013 is even growing, as some of them are being refracked (especially in the Haynesville). In the “Well quality” tab the production curves are shown for all these horizontal wells. I’ve preselected the oil basins (see the “Basin” selection). As the bottom graph shows, the average cumulative production from wells that started early 2016 is now already as much (~135 kbo) as from wells that started up to 4 years earlier, due to improved initial productivity. This “Ultimate recovery” overview shows the clear relationship between cumulative production, and production rates, over time. Also here I’ve selected the major oil basins, and the wells are grouped by the quarter in which production started. The red line marks the performance of the 1284 wells that started in Q3 2016; after 11 months, they recovered just over 100 kbo. I estimate that their cumulative production will be in the range of 200 -250 kbo once they reach a production level of 30 bo/d. If you switch to gas, you can see that the same wells also produced on average 286 MMcf of natural gas. On the Get the Data the latest production data is again available. Next week I will have a post with the September production from North Dakota. Louisiana Department of Natural Resources. Similar as in Texas, lease production is allocated over individual wells in order to estimate individual well production. Texas Railroad Commission. Individual well production is estimated through the allocation of lease production data over the wells in a lease, and from pending production data. 1. The EIA is now also including the Anadarko basin, which is for a large part in Oklahoma, which I do not yet cover. This already explains ~400k bo/d. 2. From the EIA DPR FAQ: “The DPR looks at total production coming from the regions indicated by county boundaries in the map provided. As such, it does not distinguish between volumes produced from shale/tight resources and those sourced from traditional hydrocarbon reservoirs” (https://www.eia.gov/petroleum/drilling/faqs.php). I look at slightly different basin boundaries, but more importantly, I only include the production from horizontal wells. Please consider putting together a graph showing the contribution by basin for the same time period. The overviews shown here are highly interactive, which allows you to answer many questions yourself. For example, if you click on the “Show production by” selection, and change it to “Basin”, you will see the picture below, which may be what you were looking for. There are several other options shown, e.g. by “Formation” or “Production level”. By tapping / clicking on the graphs, more information is shown in tooltips. Enno. Thank you so much for continuing to compile this data and presenting it in such a straightforward and easy to use way. You are very talented. You also are very driven and disciplined, as you have continued to timely post data as it is released. It seems that, hopefully, many shale myths have been exposed. I think you have played a very big part in this through presenting the facts on shaleprofile.com. Facts trump all (no pun intended) and I very much respect that you have stuck to the facts, production data. So many lie freely, with little to no consideration of the consequences. Your shaleprofile.com is truly a breath of fresh air. Honest and straightforward as possible. 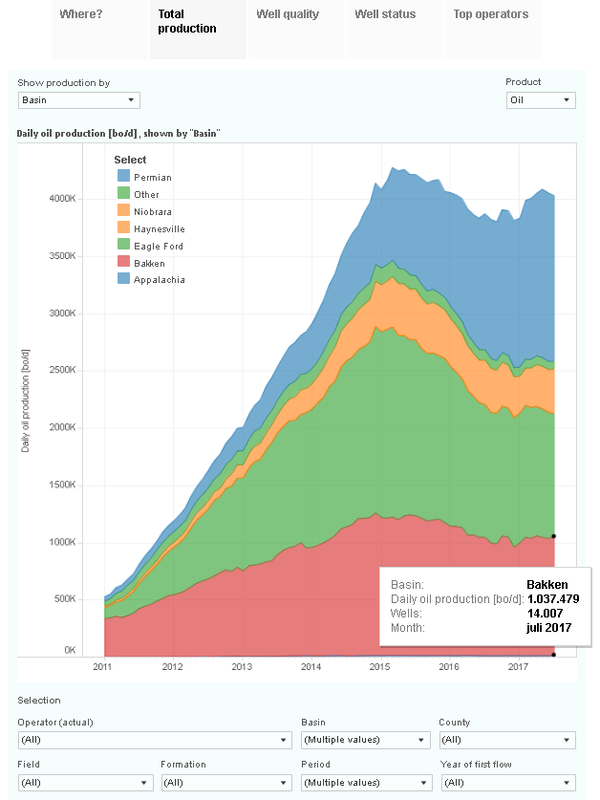 US shale oil production has been a major surprise, not even foreseen just a few years ago. However, it does not mean infinite oil supplies forever at prices seen in the twentieth century, as so many have claimed and desired. What a wild ride it has been. I am very hopeful for some price stability, at current WTI, or somewhat higher. 2015-2017 has been a trying time for conventional producers in the US. $20-low$30s well head prices in late 2015 through early 2016 was a harrowing experience for us. Our father believes it has been the worst economic time in our little field in the almost 40 years he has operated in it. Thank you Jim, also for all your own excellent contributions here! Thank you very much for the kind words sir, that means a lot to me. Presenting the actual facts regarding the shale oil & gas developments has indeed been, and continues to be, my aim.